GRACIOSA, DELICADA E COM FORMAS IRRETOCÁVEIS!! EL SHADY ZORRERO X APOLLO VM X DASH TA FAME. Peso: 436 - Altura: 1,44. DAKOTA TA FAME já soma 8 pontos pela ABQM e obteve ganhos de R$ 1.600,00 pelo SGP. - 1°L. 1° ETAPA DO XXXI CAMPEONATO ESTADUAL 2016/2017 Três Tambores - Profissional ? Light. - 5°L. 2ª Etapa XVIII Campeonato Regional Oeste Três Tambores - Profissional ? Light. (USA) AAAT-109. Campeão Potro 2 anos, Campeão 3 anos, ganhador clássico de 13 corridas, US$ 661,697. Pai de 442 ROM, US$ 11 milhões em prêmios, 45 ganhadores clássicos, incl. 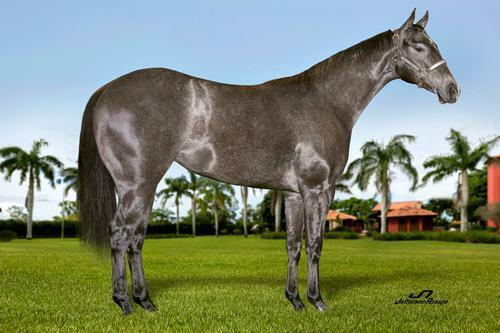 1 Champion: A DELIGHTFUL DASHER (AAAT-102, Champion, US$ 1,660,525), HEZA RAMBLIN MAN (AAAT-111, us$ 750,907), RAKIN IN THE CASH (AAAT-102, US$ 242,707), RAW APPEAL (AAAT-107, US$ 207,176), SHAZOOM (AAAT-102, US$ 178,606), etc. Foi o 3º. melhor reprodutor de 2 anos nos EUA/95, na sua 1ª. geração. SI 92 (Fol?s Native TB). 3 wins to 3, $11,745. Dam of? Manor Downs Derby [G2], Kansas Derby [G2]. Dam of? Royal Quick Dancin SI 90. 4 wins to 7, $21,009. Dancin Gol SI 93. Winner to 5, $12,291. Fols Dancing Kaye SI 89. 2 wins in 3 starts to 3. Fols Dashing Doll SI 82. Winner at 2. Dam of? No Spin Zone SI 89. Winner to 6, $14,071. Shoot An Run. Winner to 3. Miss Sky Lark SI 96 (Moon Lark). 2 wins to 4, $5,717. Fols Dancing Waters (Fol?s Native TB). Winner at 2.